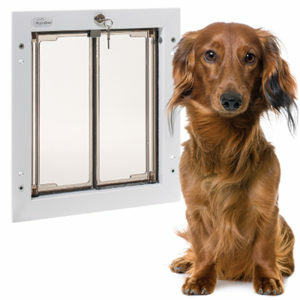 Cheaper dog doors and cat doors have flaps that must be replaced every now and then. The flaps become worn by pets using the door, and by the forces of weather. Some pet owners replace the flaps several times every year, others once a year or every second year. It depends on what type of pet the family has, how many pets, and where the door is installed. The PlexiDor has a different construction with saloon-style panels that never need to be replaced. The panels are manufactured from a special material, designed to withstand both weather and daily abuse by rambunctious pets. This design costs more to manufacture, but saves money and trouble in the long run. The PlexiDor’s frame is made from aluminum – a more expensive material than most pet doors. On the other hand, the frame will never warp or crack, and it will maintain its functionality and look through the years. It is also energy efficient, meaning it won’t let outside weather indoors. In hot climates, the PlexiDor will save on AC costs compared to having a cheaper door, and in cold climates, it will save on heating costs. The construction and weather seal keeps weather and wind outside. Security is another aspect. The PlexiDor locks from the inside, and comes with a metal security plate. Many cheaper pet doors can be kicked open even when locked, but it is very difficult to force a PlexiDor open once it’s locked and has the security plate attached. And, the PlexiDor comes with a ten year warranty.